Due to food safety concerns, some consumers are willing to pay a premium for local organic produce. With almost no manufacturing taking place in Hong Kong, there is little need to worry about local produce being grown in contaminated soils. In addition, many local organic farms have their soil and water tested regularly by the AFCD. Purchasing organic produce alleviates consumer concerns about pesticides. In spite of these advantages, Hong Kong producers are still only able to capture a tiny sliver of the vegetable market. There are two primary reasons for this. First, high land and labor cost makes local production uncompetitive. Second, Hong Kong’s warm season, from April/May to September/October, is unsuitable for producing some of the most popular vegetables such as carrots, broccoli, cauliflower, celery, spinach, beets, tomatoes and lettuce. In this highly competitive market, some sellers can earn more if they have these popular vegetables for sale when other sellers do not. Unscrupulous sellers may therefore try to pass off produce imported from the mainland as locally grown in order to gain a competitive edge. 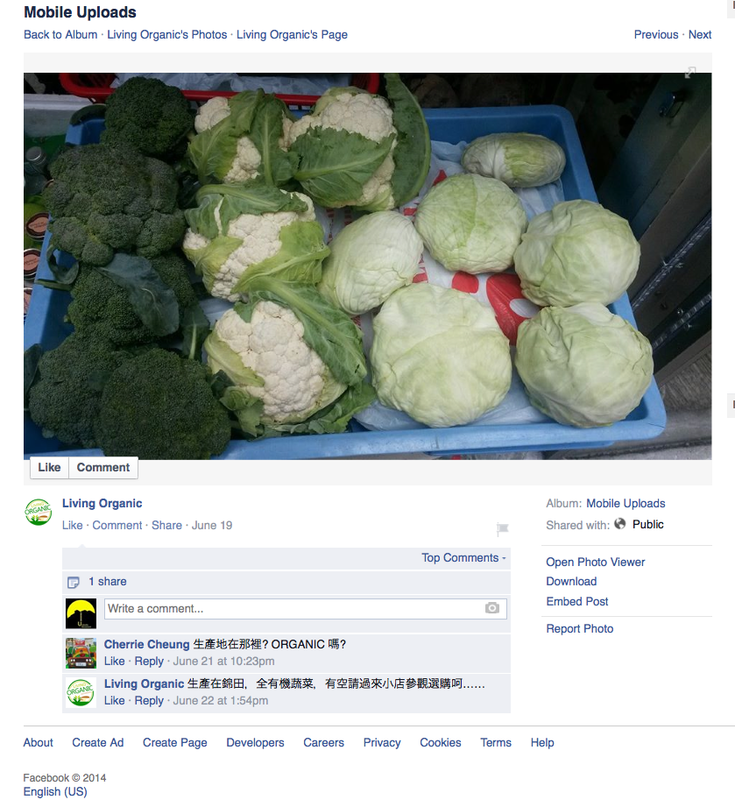 In the photo above, a local seller claims to be selling locally grown broccoli, cauliflower and cabbage on June 19th 2014. By comparing the preferred growing temperatures of these plants with Hong Kong Observatory data we can ascertain that they were in fact not likely to have been grown locally. Broccoli, cauliflower and cabbage prefers cool temperatures between 15.5 and 18C. Depending on variety, these plants can still grow reasonably well at temperatures up to 25C or so. In Hong Kong, it takes about 3 months to grow a head of these vegetables (growing times vary in different parts of the world due to varying day length and sunlight intensity). It is critical that temperatures are not excessively hot during the final head formation stage. At higher temperatures, the heads start to deform in shape, deteriorate in appearance and remain small in size. Hong Kong observatory data shows that the mean daily maximum air temperature in June was 31.5C. Whats more, between May 30th and June 18th there were 5 very hot weather warnings. The vegetables in the photo however show no signs of heat stress. At high temperatures, broccoli and cauliflower will not grow to full size and the heads will become loose and discolored. Cabbage leaves will deform, unable to form tight, compact heads. All the vegetables in the photo are near perfect – large, uniform and tight. While this is just one example, Facebook entries show that this same seller was selling many different cool season crops throughout the entire summer as the weather becomes even more inhospitable for them. While this sort of technical analysis may be a little too much when you just want to buy a head of cauliflower there is a simpler way to reduce the risk of being cheated. The most effective way to ensure you are getting local produce is to buy from local farmers markets. You are able to compare the vegetables at different stalls and the honest farmers will act as a deterrence against the less scrupulous.